Published on July 2, 2015 in Featured Article and National. Closed Tags: construction, construction industry, contractors, economy, ELFA, equipment, Equipment Leasing, equipment rental, heavy equipment. Published on May 4, 2015 in Daily Dirt and National. Closed Tags: construction industry, contractors, economy, ELFA, equipment, Equipment Leasing and Finance Association, financing, heavy equipment, leasing. 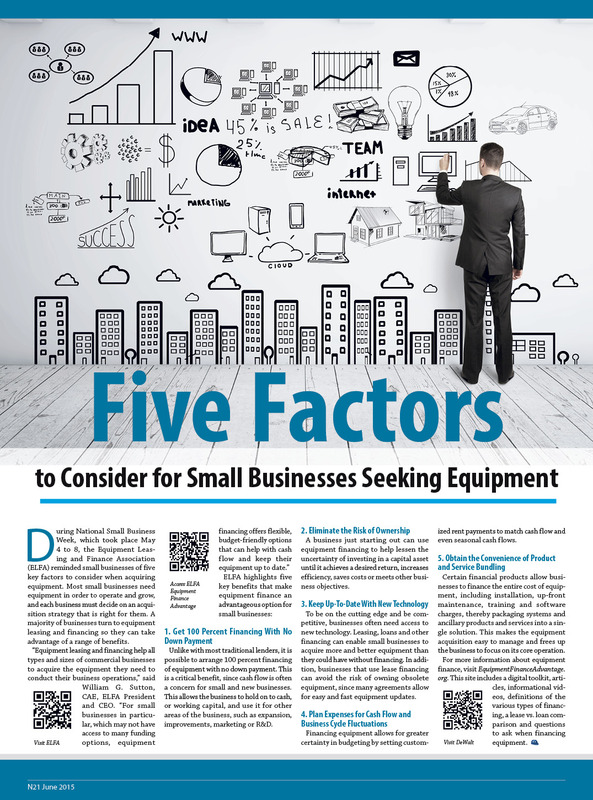 During National Small Business Week, May 4–8, the Equipment Leasing and Finance Association (ELFA) is reminding small businesses of five key factors to consider when acquiring equipment. Most small businesses need equipment in order to operate and grow, and each business must decide on an acquisition strategy that is right for them. A majority of businesses turn to equipment leasing and financing so they can take advantage of a range of benefits. Get 100 percent financing with no down payment – Unlike with most traditional lenders, it is possible to arrange 100 percent financing of equipment with no down payment. This is a critical benefit, since cash flow is often a concern for small and new businesses. This allows the business to hold on to cash, or working capital, and use it for other areas of the business, such as expansion, improvements, marketing or R&D. Eliminate the risk of ownership – A business just starting out can use equipment financing to help lessen the uncertainty of investing in a capital asset until it achieves a desired return, increases efficiency, saves costs or meets other business objectives. Keep up-to-date with new technology – To be on the cutting edge and be competitive, businesses often need access to new technology. Leasing, loans and other financing can enable small businesses to acquire more and better equipment than they could have without financing. In addition, businesses that use lease financing can avoid the risk of owning obsolete equipment, since many agreements allow for easy and fast equipment updates. Plan expenses for cash flow and business cycle fluctuations – Financing equipment allows for greater certainty in budgeting by setting customized rent payments to match cash flow and even seasonal cash flows. Obtain the convenience of product and service bundling – Certain financial products allow businesses to finance the entire cost of equipment, including installation, up-front maintenance, training and software charges, thereby packaging systems and ancillary products and services into a single solution. This makes the equipment acquisition easy to manage and frees up the business to focus on its core operations. For more information about how equipment finance equips business for success, visit www.EquipmentFinanceAdvantage.org. This site includes a digital toolkit, articles, informational videos, definitions of the various types of financing, a lease vs. loan comparison and questions to ask when financing equipment. Published on February 13, 2015 in Featured Article and National. Closed Tags: ABC, Associated Builders and Contractors, construction, construction industry, contractors, economy, ELFA, employment, Equipment Leasing & Finance Association, jobs, unemployment. Published on December 20, 2013 in Daily Dirt and National. Closed Tags: construction, construction industry, contractors, economy, ELFA, equipment, Equipment Leasing & Finance Foundation, heavy equipment. 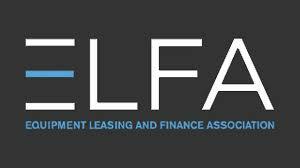 The Equipment Leasing and Finance Association’s (ELFA) Monthly Leasing and Finance Index (MLFI-25), which reports economic activity from 25 companies representing a cross section of the $827 billion equipment finance sector, showed their overall new business volume for November was $6.6 billion, up 3 percent from new business volume in November 2012. Month-over-month, new business volume was down 13 percent from October. Year to date, cumulative new business volume increased 5 percent compared to 2012. Receivables over 30 days were at 1.8 percent in November, up slightly from 1.5 percent in October. Delinquencies declined from 2 percent in the same period in 2012. Charge-offs declined to once again match the all-time low of 0.3 percent from 0.4 percent the previous month. Credit approvals totaled 76.5 percent in November, a slight decrease from 77.6 percent the previous month. Forty-seven percent of participating organizations reported submitting more transactions for approval during October, a level more in line with previous months’ activity after a spike to 82 percent last month. Finally, total headcount for equipment finance companies was up 1.4 percent year over year. 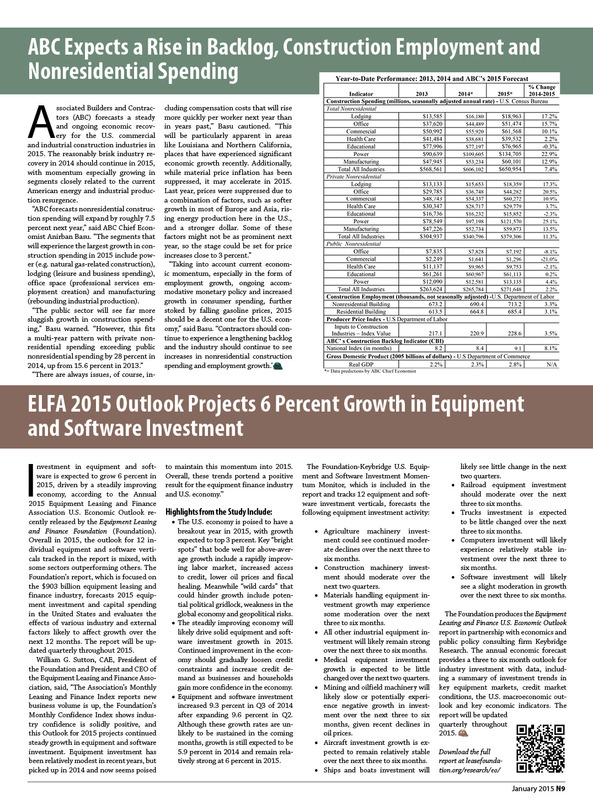 Separately, the Equipment Leasing & Finance Foundation’s Monthly Confidence Index (MCI-EFI) for December is 55.8, a decrease from the November index of 56.9, reflecting industry concerns over uncertainty regarding capital expenditures (capex) and competitive market pressures in 2014, among other issues.